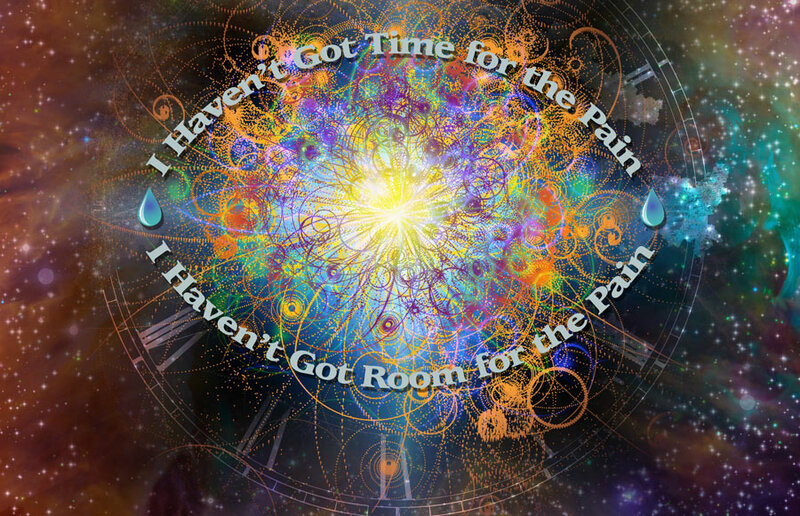 Healing Resonance Articles by Kristi Borst: No Time, No Room, No Need for the Pain! Good questions, right? I am coming to think it’s somewhat ingrained in our human nature. Five things happen to us in a day … four of them loving and positive and one negative. It’s that negative singularity that commands our attention. Why do we focus on that thing that we don’t like? Why do we give it power to control our happiness? Why do we let it affect our relationships with others who are there to love us? Let’s not just skip over this; perhaps it’s a truly profound question and also a key to the next level of happiness. Each of us needs to invest in ourselves and answer these questions in our own unique ways. What if the answers you receive illuminate some of the key ways YOU are HOLDING YOURSELF back from being yourself … your True Self. What if your focus on and clinging to the negative is the key thing limiting in your life?!? This need to focus on that negative thing is frequently rooted in “the original wound”. What, is the original wound? It’s that part of each of us that most needs healing. Typically established in our childhood years, it’s like a scab that can continually be ripped off, perhaps when we least expect it. There is hope; there is help! Awareness = The Power of Choice = The Power to Change! If you've read my ABOUT page, skip to the next paragraph. My original wound is grounded in the energy of "Who can I be if even my daddy cannot love me for who I AM?" I was born with healing abilities. I healed my own flesh wound as a toddler. My dad, who witnessed this, told me to "never do that again." I was obedient and shoved this part of me WAY down. I basically forgot who I AM for many, many years. What I now see as his protection of me (not the time or place for me to be healing) and part of my path (Higher Soul Challenge for this Lifetime), felt like total rejection in that space and time. For me, it set up a pattern of wanting to please others and feeling the need to be accepted by others. I've largely worked through my "original wound" because I am aware of it, watch for it, and choose to not let it hold me back. Also, on some level it's pretty comical ... that someone with the abilities to help many people in an unusual way is worried about standing out! Haa haa ... self sabotage I see you. When we hold ourselves back, we are not fulfilling our "mission" of being our authentic selves. It does not serve us; it does not serve God/The Universe/The One of which we are an integral part. We need to search for these self-limiting mis-perceptions and break through them like MythBusters! I stand out by nature and yet I care what others think of me. It's absurd. Yet, once I saw the absurdity of my situation, I could make a decision to not let this thing hold me back. A light bulb moment was when I realize this obstacle may have been something I took on as a Higher Soul challenge! I have boldly stepped forward to unveil myself and my capacities for helping others to heal. I am NOT blending in ... in fact, I have broken the box that previously contained and nearly obliterated me ... never goin' back again. One of the epiphanies of my moving forward was the realization that "what others think about us is truly none of our business". Our judgment of others is based upon our own stuff (see "I Don't Resonate with That". On perhaps an unconscious level, judgment of another is based upon our feeling inferior or seeing something we recognize in ourselves but are not yet ready to face. With this knowledge, we can look at others who judge us with compassion for the ways we've triggered THEIR stuff. Perhaps more importantly, we need watch how we are judging because that is showing us where we need to focus our self-improvement efforts! Are You Sure You've Got This, Kristi? Two nights ago, I was revisited by the rejection of a former friend. This is someone with whom I had a decades-long sisterly relationship. As soon as I started Healing Resonance, she “dropped me”. On Friday she saw my brochures displayed in my chiropractor’s office (I am referred to patients who are holding deep emotional blocks, wounds or traumas). This “lost sister” explained that she “used to know me before I got weird", yet asked the doctor to say “hi” to me. She apparently looked at my brochure and put it back. The “hi” message and relaying of the conversation (particularly the part about knowing me in the past tense) hit me like a blow to the heart. I felt that rejection from three years ago as if the scab was ripped off. I tried to put the pain away, but there it was. Life went on. I attended the light-filled memorial service for a friend’s mom. There, I saw some friends I hadn’t seen for a while and was enveloped in love. The pain was still there. I experienced a healing session with a client who has gone from physically and emotionally ailing to thriving. I was elated, but the pain was still there. Thirdly, I received an email from someone I had met earlier in the week encouraging me to keep shining my light. I was responding to the email and relating how buoyed I was by the writer’s sentiment when the absurdity of my friend's rejection/pain paradigm struck me. My former friend was meeting with my chiropractor due to their mutual interest in local land trusts. How could she be passionate about saving open land, yet not support my Healing Resonance passion for assisting other humans? I could see that what had initially appeared to me as rejection or a limited perspective could ultimately be part of HER path and purpose. Who was I to judge her? Why could I not just walk away with the "hi" comment? My compassion and love for her returned, and in that instant my heart mended. Compassion and forgiveness ... two of our Super Powers! When we accept or even try on another’s view of us as our identity, we are essentially setting ourselves up for struggle, pain, rejection, and a roller coaster of other emotions. It is rare that someone else’s opinion of us is now, nor ever has been, the Truth. No two of us can stand in exactly the same spot nor have exactly the same filters/stories/wounds, so we will never see another clearly [please see “Will We Ever See Eye-to-Eye”] unless we see with the eyes of unconditional love. Our focus, however, must be to clearly see ourselves. Identifying and releasing the hold that the old wounds have on us frees us to be our authentic selves. Conversely our wounds, our fears and our acceptance of others’ judgment may be the only thing holding us back from being who we are here to be. Let it go! Let it go … if you need assistance, I am here. What is My Original Wound? Pause for a moment and ask yourself “What is my original wound?” “How does it impact and limit my daily happiness?” As I relay my life experience and how it's interacted with this "original wound", think about how you can observe yourself in this way. This type of self-observation may bring you a Perspective Reboot® or at least some ideas of what layers you need to address in your own healing. You were born perfect. You are perfect. Release the situations, words, energies that have or currently mask that reality from your own view. We are here to be that special radiance, that unique genius, that wonderful expression of perfection … expressed mentally, emotionally, spiritually and physically. In doing so, we make this “reality” better for each one and the whole. It is why we are here! Being rejected bites, but ultimately, we have to know ourselves and know what is and isn't “real”. I accept that she cannot see me, but I still see myself. I acknowledge my free will and go within to that ultimate place of inner peace, calm and beingness. I am grateful to be alive. I choose happiness. I choose joy. I choose self-expression. I choose goodness. I choose to live as the one I am here to be for The One. Find your unique expression of joy, goodness, love and light and release that which no longer serves you. Replace pain with love and light!